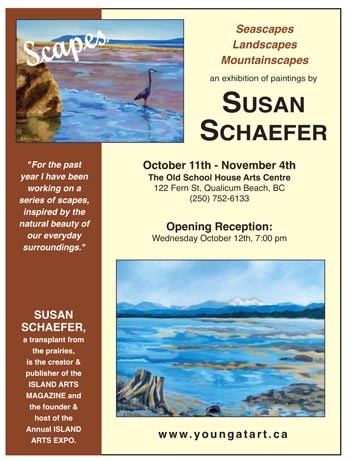 When Corinne from The Old School House Arts Centre, (TOSH) in Qualicum Beach, approached me last August and asked me if I wanted an exhibition there in October, my first reaction was major panic. I said "This October?!!" "No", she said, "October 2011". "Oh, next year. ", I said. Well needless to say, I was over the moon with excitement about being asked to exhibit my work. What an honour! My second reaction was, 'oh my gosh, that's only a year away! First I felt that I needed a place to work. After the Island Arts Expo in November 2010, I approached a friend of mine and asked if I could rent some space in her studio. I knew that it had been vacant for couple of years and would be a perfect place to work. I started moving myself (along with car loads of art supplies) into the studio. I spent the first few weeks just having fun - experimenting with new materials, playing around with texture, etc. Even doing a few abstracts, which I had never done before. I got many old projects out of the way. It was great! After the new year I decided that I better get to some more serious work. Fast forward several months... and NOW we are only a few weeks away. Oh my gosh! My paintings are ready and they look great! I need to work on the marketing. But that's another story!